The ADRC was invited to the International Conference on Disaster Risk Reduction Legislation and Policy as part of the Asian Forum of Legislative Information Affairs (AFOLIA). The Conference was organized by the Ministry of Government Legislation in cooperation with the National emergency Management Agency. 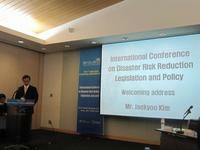 Specifically, the ADRC made a presentation on "Disaster risk reduction legislation and policy in Japan" at Part I "Disaster risk reduction legislation and policy in Korea, China and Japan and cooperative measures" of the Conference. Other participants include representatives from Chinese government, UN and various organizations and universities The Forum was the first of its kind organized by the Ministry of Government Legislation and encompassed many areas, not only disaster risk reduction but many other fields as well. It manifested a strong initiative being taken by Korean Government within Asia. While an interest in a post HFA (Hyogo Framework for Action) 2005-2015 and a need to establish international disaster response laws (IDRL) were growing, discussion on disaster legislations at the Conference was indeed significant and meaning attempt.